As the demand for “green” energy increases the offshore wind power industry is expanding at a rapid pace around the world. 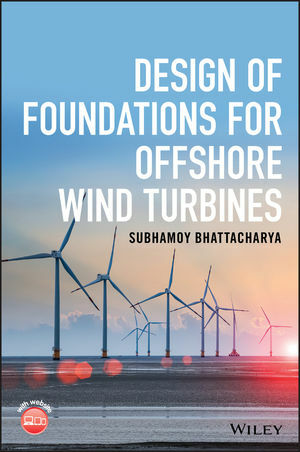 Design of Foundations for Offshore Wind Turbines is a comprehensive reference which covers the design of foundations for offshore wind turbines, and includes examples and case studies. It provides an overview of a wind farm and a wind turbine structure, and examines the different types of loads on the offshore wind turbine structure. Foundation design considerations and the necessary calculations are also covered. The geotechnical site investigation and soil behavior/soil structure interaction are discussed, and the final chapter takes a case study of a wind turbine and demonstrates how to carry out step by step calculations. New, important subject to the industry. Includes calculations and case studies. Accompanied by a website hosting software and data files. Design of Foundations for Offshore Wind Turbines is a must have reference for engineers within the renewable energy industry and is also a useful guide for graduate students in this area. SUBHAMOY BHATTACHARYA, PHD, is a Professor and Chair in Geomechanics at the University of Surrey. He is also a visiting fellow at the University of Bristol. His main research interest is the design for offshore wind turbines. He has also worked as a consultant in the in the civil and offshore engineering industry.